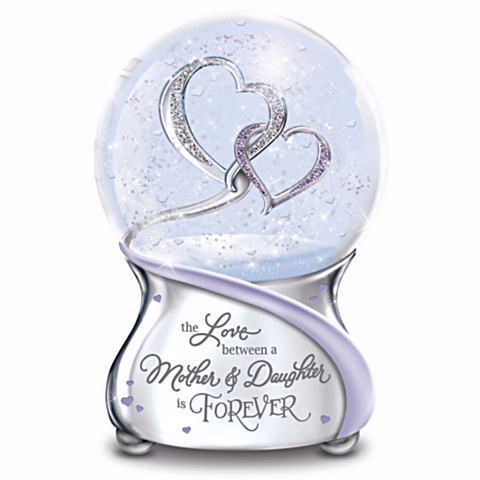 Sometimes you want to give Mom a special gift that can only come from someone as close to her as her daughter. 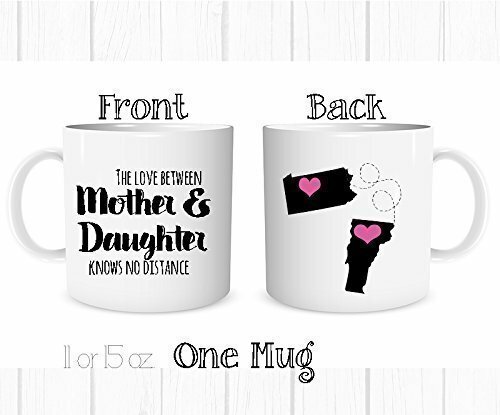 These thoughtful gifts are the perfect presents that honor the amazingly unique mother-daughter bond. 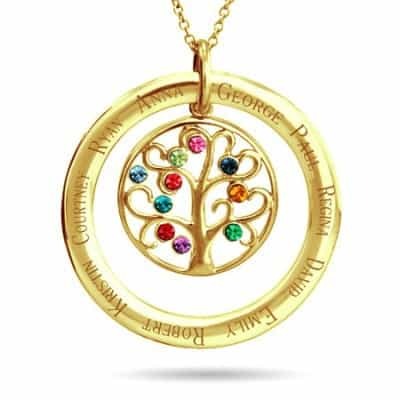 Family tree gifts are fabulous gifts for mom from her daughter - they're a wonderful way to celebrate your loving family ties. 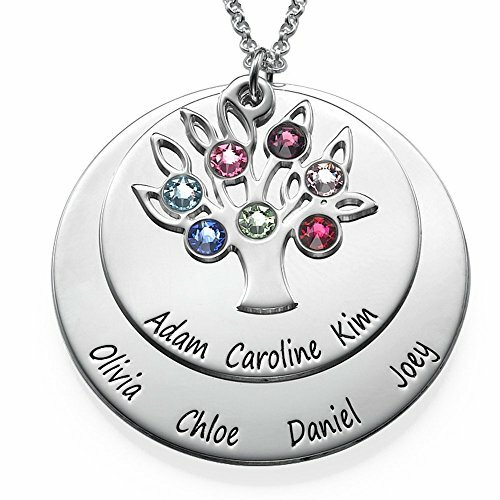 Sterling silver necklace features up to 7 family member's names, each engraved in an elegant script on individual leaves. 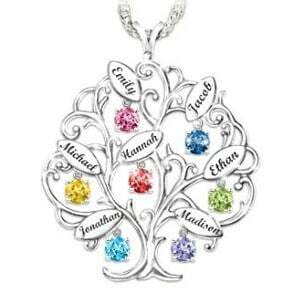 Thrill Mom this Christmas with this stunning family tree necklace! 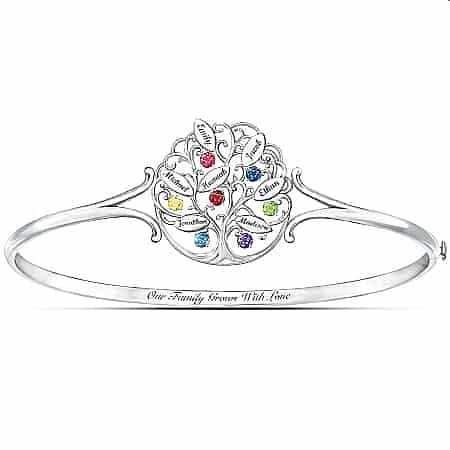 The corresponding birthstone dangles gracefully from each leaf. Additional clear crystals are sprinkled throughout to add just the right amount of sparkle. Mom will enjoy wearing this necklace for years to come! Mom or Grandma can celebrate those she loves best all year long with this striking family tree sculpture that can be displayed on the table or hung on the wall! 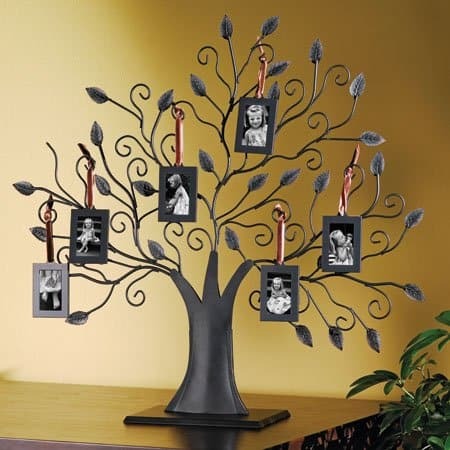 Available in two colors, the tree comes with 6 small frames that she can fill with favorite pictures of her family. (You can order additional frames if you need more). Warm Mom's heart and body at the same time with this super-snuggly blanket - available in 5 lovely colors. 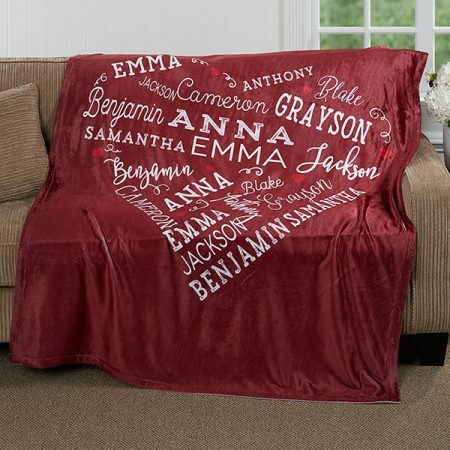 Ultra-soft blanket is made out of washable fleece, and is the perfect weight and size for snuggling indoors with while reading or watching TV. Her favorite part, though, will be the names of up to 21 of her loved ones printed in a repeating fashion in a heart shape. A mother and daughter share a special relationship. It’s a bond that is sealed at birth and grows into a treasured friendship that lasts a lifetime. Highlight this unique connection this Christmas with this stunning lucite heart that features a touching sentiment to express your love. 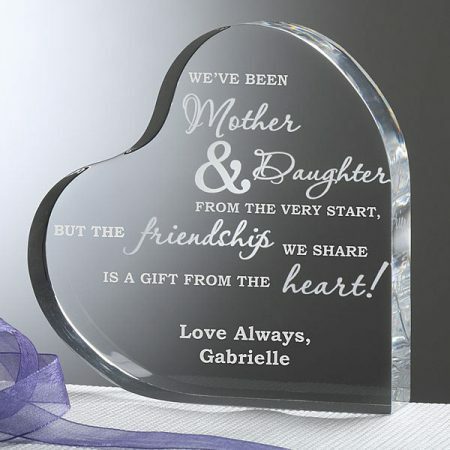 Through a cutting-edge engraving process, the heartfelt script is engraved on both the front and back to produce a transparent mirage that acts as a 3-D love letter. For the perfect present, you can polish it off with a personalized message. Finally…a Christmas gift for Mom that will make her laugh and make your siblings totally jealous of you. What more could you want in a Christmas present? If you really want to nail your favorite child status, you may want to ante up for a new coffee ﻿﻿m﻿﻿﻿aker﻿﻿ for Mom as well! This Mother's Day, celebrate all of your family’s most important events in one sure-to-delight gift! 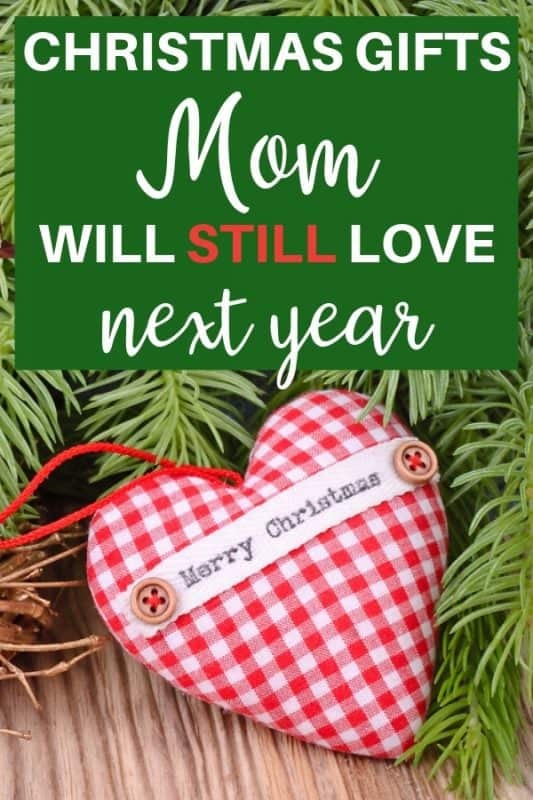 One of our top Christmas gifts for mom 2017, she’ll cherish this super-cute gift for years to come! 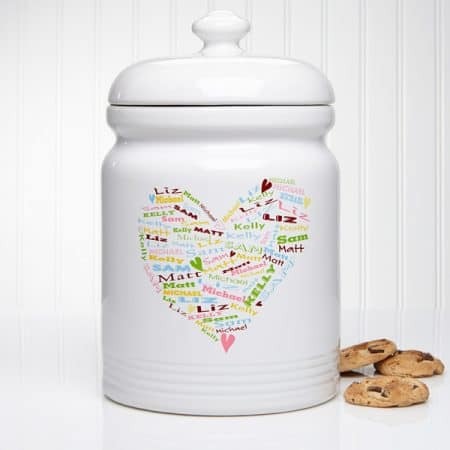 For a gift that can contain her tastiest treats, this cookie jar features a heart-shaped design that is filled with up to 8 cherished names. 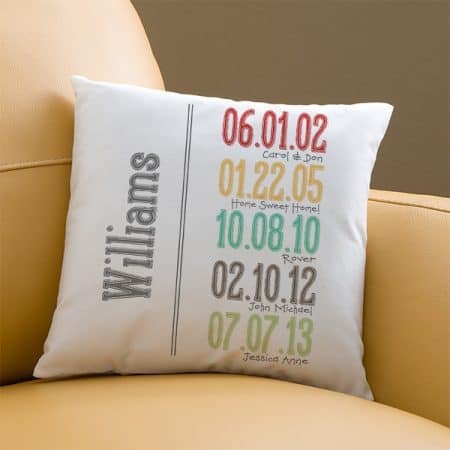 With 4 color combinations to choose from, you can create a gift that is uniquely hers. When she fills it with cookies, it will fill her heart with love as she remembers the precious family that is represented. A sweet gift from her daughter that the whole family will enjoy! Pretty much the only appliance (other than her dishwasher) Mom needs! It’s a slow cooker, rice cooker, pressure cookie, porridge maker, steamer & warmer, saute/browner, and a yogurt maker. Perfect for the Mom who lives a fast-packed, health-oriented green life style…saves time in the kitchen (speeds up cooking 2-6 times) and uses less energy. Quicker cooking preserves nutrients. Give Mom the gift of extra time this year with this brilliant time-saving appliance. 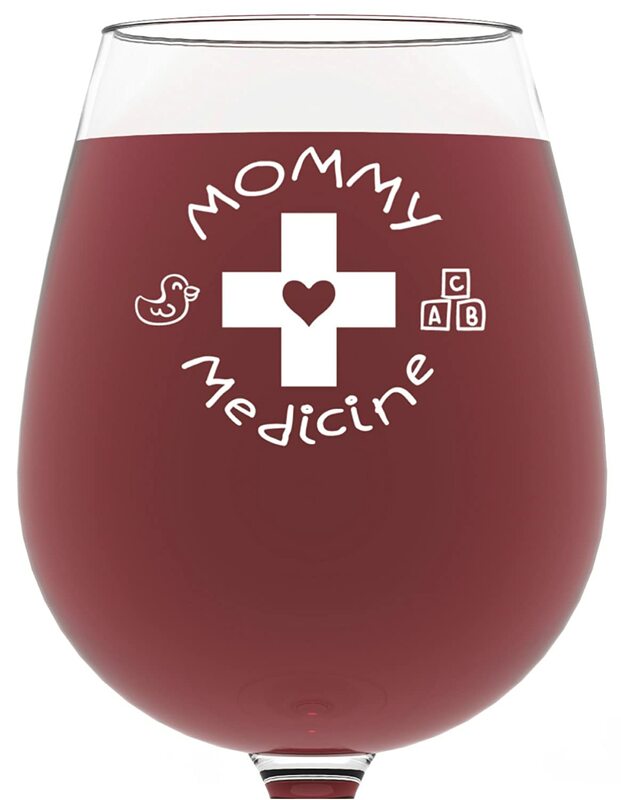 Mom deserves a chance to relax, sit back and enjoy a glass of wine (or several). Click here to see the complete selection ﻿﻿of﻿﻿ funny wine glasses. 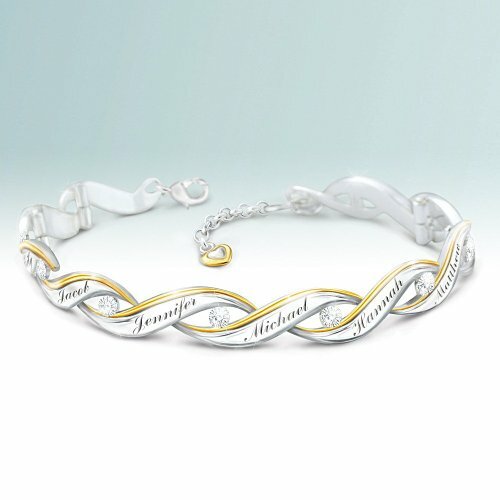 This stylish bracelet goes a step beyond traditional Mother’s jewelry by providing the option to engrave up to 10 children’s names on wave-shaped links. The bracelet features 10 genuine diamonds nestled among the sterling silver and 24k gold links, which makes it a real show-stopper. Treat Mom to the gift of relaxation this Christmas with an all-organic bath bombs set. Set of 6 handmade bath bombs – each with a unique essential oil aromatherapy blend that will leave her feeling relaxed and peaceful. 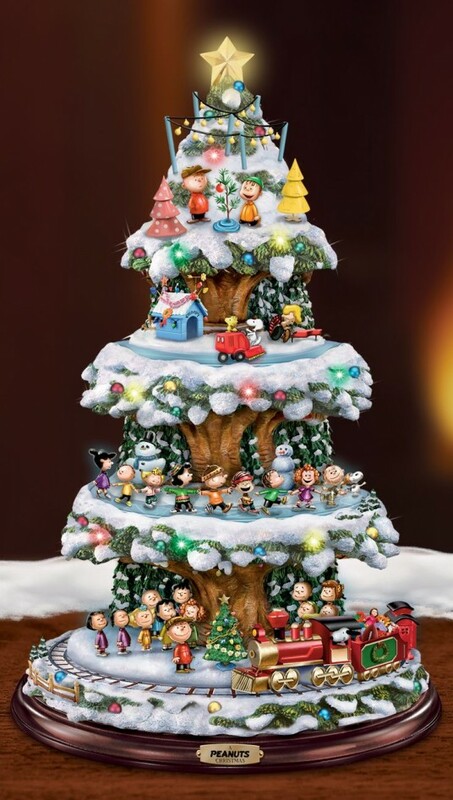 This holiday season, consider the personal gift of a tabletop Christmas tree for Mom. 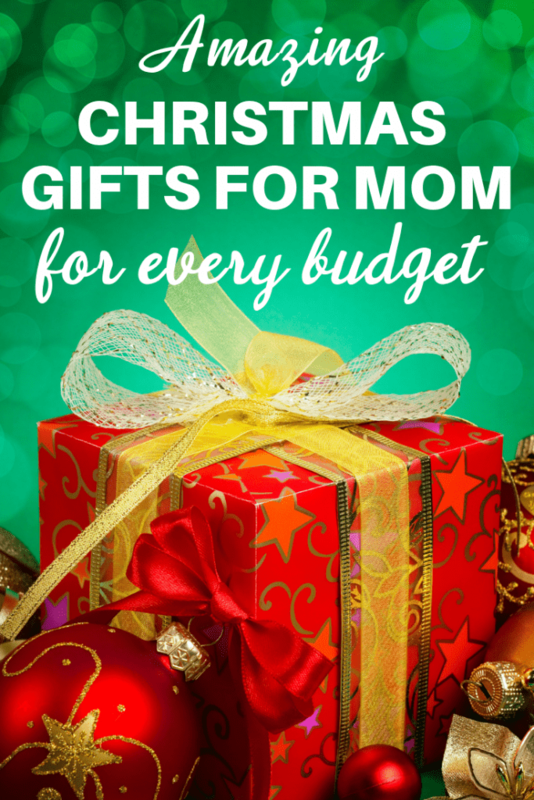 With many to choose from, including well-known brands such as Disney, Rudolph the Red Nosed Reindeer, Peanuts, Thomas Kinkade and more, you’re sure to find the perfect one for Mom. These tabletop Christmas trees are the perfect addition to any family’s Christmas decorations – they’re especially thoughtful for the mother who might be downsizing her home. Surprise someone special with not just one gift, but 4 gifts at once! Fashionable Anne Klein watch set features a lovely round watch and 3 bangles. Mix or match to create a look that’s just hers – perfect for the stylish woman who has a flair for individuality. Available in gold/black (pictured above), black, or rose gold/ivory. Lovely suncatcher features pressed real flowers inside the butterfly wings. A heart charm that’s engraved with the word “Mom” dangles gracefully below the butterfly. This polished sterling silver heart pendant is a great way to let your mom, grandmother or wife show off the apples of her eye in a unique way. The center charm features a spinning heart that glitters with genuine diamonds. 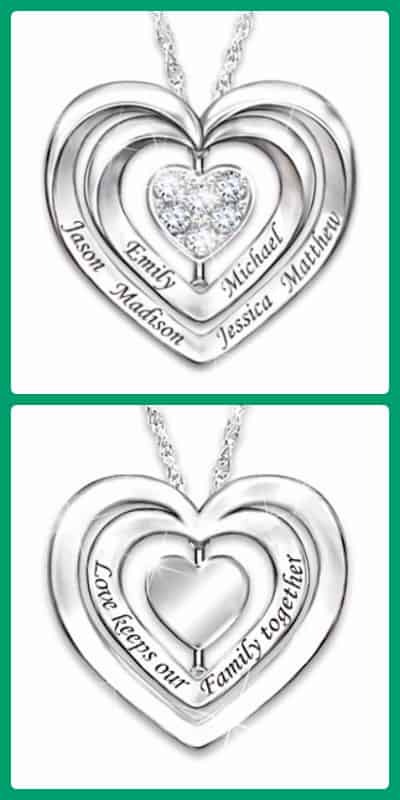 The two outer heart charms can be engraved with the names of up to 6 loved ones. You might consider adding the parents’ names on the inner heart and the kids’ names on the outer heart. 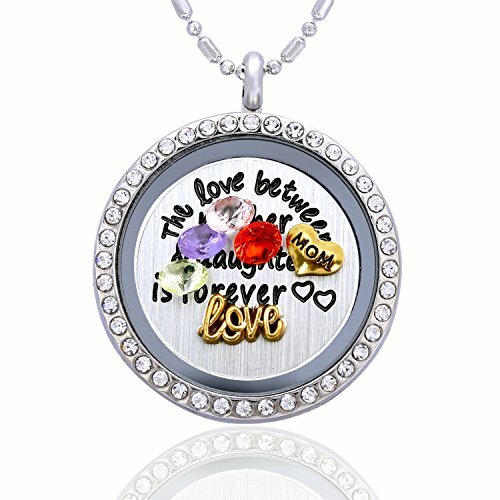 With an 18-inch chain, this unique jewelry piece will lay near her heart, which is exactly where she holds the love for each of her children. Surround Mom or Grandma with the faces of those they love best with a digital photo frame. The highly-rated frame pictured here is simple to use – and can be controlled remotely so Mom never has to lift a finger! Use the web app to upload pictures from your phone or tablet, as well as Facebook or email. They’re Not Just for Waffles Anymore! The humble waffle iron is now one of the hottest kitchen appliances around! Why? Because now people have discovered all sorts of scrumptious foods that can be prepared in a waffle iron. Everything from brownies to omelets to mac and cheese – check out these recipes on Pinterest for just a few suggestions. So if your favorite lady doesn’t have a waffle iron, this is definitely the year that you should get her one…maybe she’ll let you try some of her amazing concotions! Give Mom the gift of relaxation and well-being this Christmas with a therapeutic aromatherapy diffuser. Add tap water and essential oils (sold separately) and this diffuser will quietly fill the room with scented water. Different oil scents are designed to improve health, increase energy or help you sleep better. A perfect choice for the woman who could use a little relaxation! 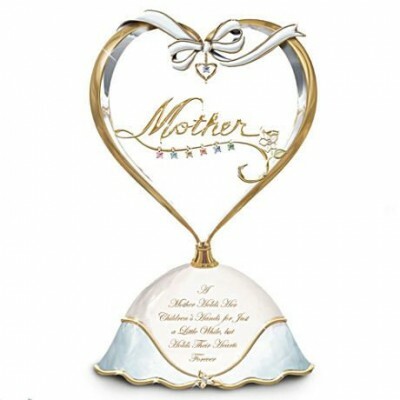 Gve Mom a gift that sings the tune of your love with this keepsake music box, which features faceted glass birthstones to represent Mom and up to 6 children. Playing “Always in My Heart,” this one-of-a-kind piece consists of a 22-karat gold heart, which lovingly encases “Mother” and the birthstones of her cherished children. Supporting the heart is a porcelain base that is finished with hand-applied enamel and a 22-karat gold message inscribed on its surface for a Christmas gift that is music to her ears and warmth to her heart. It’s not always convenient or affordable for Mom to go to a masseuse whenever she wants to relax with a massage. She can soothe tired muscles any time she wants with an at-home massager. If you have the budget, go all out with a reclining massage chair that will relax all her muscles while she reads or watches tv. Otherwise, pick a portable chair massager like the one pictured here or a massager that focuses on her specific area of discomfort. 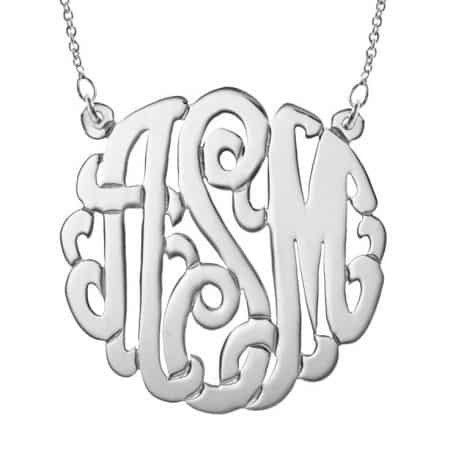 The fashionista Mom is bound to appreciate a trendy yet timeless monogram necklace! Eve’s Addiction features over 100 different monogram necklace designs, with prices starting at under $25. 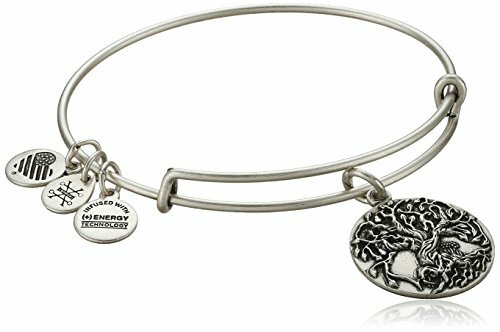 You’re bound to find a design that’s just right for your Mom. If you have been searching for a special gift for the style-conscious mother, this is it! Be the Cool Mom on the Block! Amazon Echo Show is the latest and greatest Alexa device! It's everything you love about Echo - and more. Watch videos, see music lyrics, make video calls, see weather forecasts, shopping lists and more. Use it to play music, order products (pizza, anyone? ), and control home automation. The security camera lets you monitor and stay connected to your home and family 24/7. Simple to use – just connect to the internet at home on on your mobile device!